Located in West End of London, the English National Opera (ENO) is a time-honoured elegant theatre which has always enjoyed great prestige in international art circles for its top-level art performances in the UK. On 14 August ,2013, a special performance was staged in this ancient yet magnificent palace of art. After two years of planning and nearly half a year of preparation, Jane Eyre, a modern ballet produced by the Shanghai Ballet Company grandly debuted at ENO. It is the first time for this British literary masterpiece to appear on the British stage in the form of ballet, and is the first time for the ballet production of Jane Eyre to be performed in London where the novel was first published. On evening of the performance, Chinese Ambassador to England, Liu Xiaoming and his wife, Madam Hu Pinghua, General Sir Nicholas Houghton, Chief of the Defence Staff of the British Armed Forces, Lord Mayor of Westminster Sarah Richardson, Director of Migration Directorate of Foreign and Commonwealth Office Susannah Simon, HSBC Chairman Douglas Flint, Chief Executive of Birmingham Royal Ballet Christopher Barron, Editor of the Financial Times Lionel Barber, other dignitaries from the British government, business community, cultural and press circles and an audience of more than 2,000 people watched the splendid premiere. Based on the novel of Jane Eyre, this new performance gives brand new interpretation and representation of the original novel. By adopting simple, exquisite and innovative stage artistic design and aesthetic modern ballet language, the dance drama depicts the distinct characters of Jane, Rochester and Bertha. The thrilling performance carried the audience away, and the superb skills and rich stage expression of the performers filled the audience with admiration. When the performance was over and the lights turned on, the audience gave a prolonged round of applause. The ovation lasted for five minutes. Dancers went up on the stage to take curtain calls and expressed their gratitude towards the audience’s warm support. Patrick, the German director, was moved with excitement. He knelt down on stage facing the performers to express gratitude to their wonderful performance. 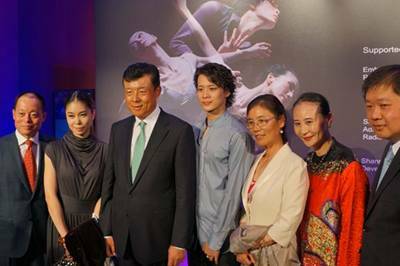 On the same night after the performance was over, Ambassador Liu held a reception for the guests who viewed the performance to celebrate the successful premiere of the Shanghai Ballet Company in London. 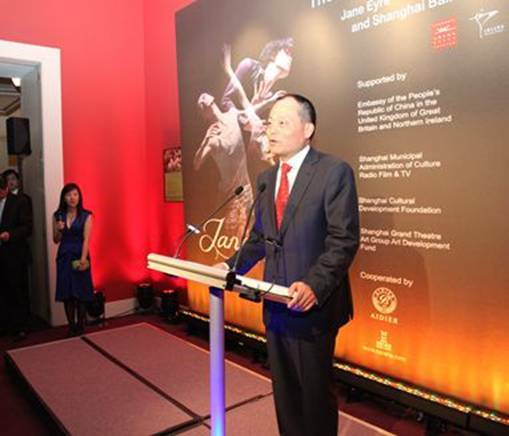 In his speech, Ambassador Liu warmly congratulated the Shanghai Ballet Company’s successful premiere in London and spoke highly of the performance. Ambassador Liu said the superb performance tonight from the Shanghai Ballet Company has given the audience a great artistic treat and also attests to their attainments in the art of ballet. Ambassador Liu said the play was a perfect combination of the literature and stage. The Ballet production of Jane Eyre is a re-interpretation of this literary classic. It transfers the story of the book to the stage. It portrays characters through dancing rather than writing. Yet, what remains unchanged and equally powerful is the message: equality, courage and the pursuit of love. It is the combination of the classic and the contemporary. The interpretation by the ballet retains the authentic English style in costume, scenery and music, but this ballet production has taken on a bold modern choreography. The body language underlines speed and strength. At the same time, the dancers move smoothly with effortless grace. In addition, the performance also unites the West and the East. Last month the whole of Britain was on 'baby watch'. Indeed, people were thrilled by the arrival of His Royal Highness Prince George of Cambridge. This ballet production of Jane Eyre is a “multinational baby'”. It is a marriage of English literature, German choreography, French costume and prop designs. Then there is the original adaptation of the Shanghai Ballet Company and performance by Chinese dancers. Of course, there is also the music by British and German composers. So this ballet work is in every measure a new 'baby' created by Chinese and Western artists. Ambassador Liu finally pointed out that China and Britain both have rich cultures and our cultures are open and inclusive. Through mutual learning we have enriched our own thinking and art. These are also examples of the ever expanding and deepening cultural exchanges between our two countries in recent years. He hoped that artists, cultural groups and agencies will enhance exchanges and cooperation and draw on each other's strengths. He hoped both countries will put on more high quality shows and exhibitions in each other's country. Through collaboration the two countries should aim to jointly produce more works reflecting the common values and feelings of both countries. Joint efforts as such will contribute to greater understanding, trust and friendship between Chinese and British people. In turn that will create a more stable and healthy China-UK relationship. Ambassador Liu’s remarks struck a strong reverberating cord in the audience. General Sir Nicholas Houghton said that the performance was amazing. Editor of the Financial Times Lionel Barber said that the Chinese dancers displayed astounding skills, and that the adaptation of the story was delicate yet very impressive. 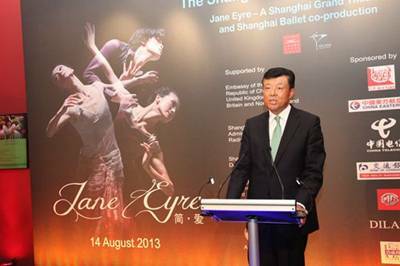 Chief Executive of Birmingham Royal Ballet Christopher Barron said that Jane Eyre, produced by the Shanghai Ballet Company was quite a daring and highly innovative move made to break away from the restraints of the novel. The skills of the young dancers of the Shanghai Ballet Company were very impressive, and their amazing performance fully exhibited their understanding of modern ballet. An editress from the Dance Review held that the Chinese dancers’ most incisive portrait of the characters drew the attention of the entire audience. Some in the audience marveled at a different Jane Eyre brought about by Chinese artists with their simple style and superb performance. Compared with the original novel and classical ballet dance, the performance produced by the Shanghai Ballet Company has added modern and popular artistic elements that are full of passion and highly impressive. As the head of the ballet delegation, Mr. Zhang Zhe, General Manager of Shanghai Grand Theatre Arts Center, talked about how the Shanghai Ballet Company’s version of Jane Eyre was produced. According to Mr. Zhang, the Shanghai Ballet Company had the idea of performing in the UK two years ago and received generous support from Ambassador Liu and the Chinese Embassy. Ambassador Liu said that they should bring quality productions to the UK that are easily to understood and comprehend for the foreign audience. In light of Ambassador Liu’s recommendation and as the result of much discussion, the Shanghai Ballet Company decided to combine a classical British novel with modern ballet and then wrote and completed this version of Jane Eyre. In the future, the Shanghai Ballet Company will continue to make efforts to produce more and better Chinese works and present them to the whole world. 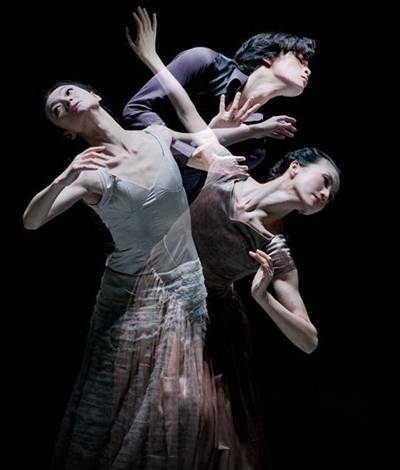 Between 14-17 August, the Shanghai Ballet Company’s ballet production of Jane Eyre staged 5 performances which attracted more than 10,000 viewers. High art performances generally cannot sell too many tickets. In particular, ticket sales in August when the British people are taking summer vacations are often lower than the annual average level. The attendance of Jane Eyre on 14 and 15 of August, however, was much higher than the average attendance of high art performances. Jane Eyre was well liked and received positive comments from people of all walks of life in the UK. Mayor Boris Johnson of London said in his letter of congratulations that the Shanghai Ballet Company’s production of Jane Eyre has drawn the UK and China closer and can be called a fine example of cultural exchanges between the two countries. The Daily Telegraph, the Times, the Financial Times and other mainstream British newspapers, Xinhua News Agency, the People’s Daily, CCTV, China News Service and dozens of mainstream and local media at home and abroad have run reports on the performances through pictures, articles or videos. The Daily Telegraph said that China’s interpretation of Bronte’s novel is refreshing. The Times held that Jane Eyre is successful in terms of the perspective of description and characterization. Although the Shanghai Ballet Company’s performances are over, the spiritual shock and artistic enjoyment it produced cannot be forgotten by its audience. The Shanghai Ballet Company’s version of Jane Eyre has also aroused a wave of experiencing and understanding Chinese culture. The British people are expecting more Chinese works to be brought to the UK to make greater contributions to the cultural and people-to-people exchanges between the two countries. London is the first stop of Shanghai Ballet Company, and more performances are about to be staged in Hamburg of Germany and Marseilles in France. In addition, a dance drama of the Shanghai Ballet Company will also take part in the 2014 Laurence Olivier Award selection to be held in London. By then, it will have the opportunity to compete with western art groups and theatres.